As soon as you arrive at Narita Airport and move towards Tokyo main city you come across a magnificent place known as Odaiba. 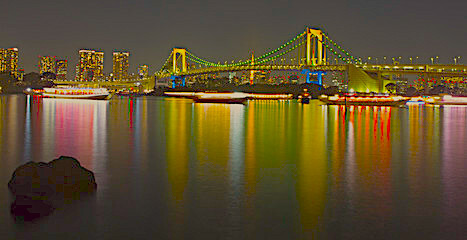 Particularly in the night, Odaiba, gives a beautiful glimpse of colors in the backdrop of Pacific ocean. There are two monorail loops, which connect Odaiba to Central Tokyo. A beautiful ship ride is also possible from Hamamatsu-cho. After sunset, Tokyo City skyline emerges and worth seeing. There are many attractions in Odaiba, including shopping complexes, onsens and Giant Wheel, Gundam Robot etc. The most fascinating thing for me in Odaiba is the sea-walk. By the coming of the evening, the seashore is filled with colorful boats and Tokyo Tower and Tokyo Skytree start glowing in a mystic darkness. Sometimes clear blue-black sky adds a magical dimension to it. It can take up to a whole day on foot. People of different nationalities can be seen in their traditional costumes. Odaiba is an icon of global culture. It is located on a reclaimed land from the sea and its landscape just fascinates. There are several Japanese and Foreign Restaurants to enjoy tasteful seafood. 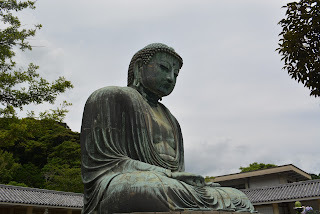 There is also a replica of Statue of Liberty, which reflects Japan-US friendship. During WW-II, Allied forces bombarded Tokyo and Odaiba was the most affected city. Un-exploded bombs-shells can be touched near sea area. There is also one aquarium to go and see colorful fishes. I recommend going there in the evening. It is a charming place to roam, sure aimlessly too.